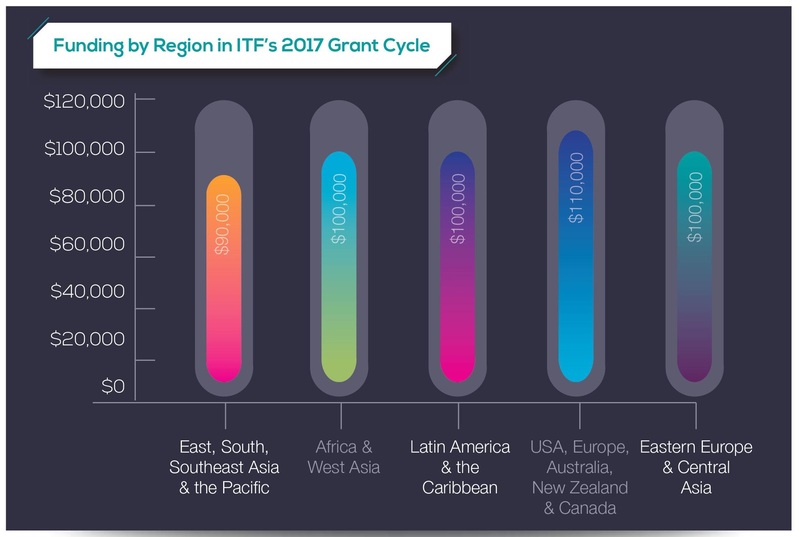 The ITF is accepting grant applications from trans-led groups with budgets below $150,000 USD based in any region of the world. The deadline to apply is December 1, at 5pm (ET/New York time). We know that writing applications can be a challenging process so we have put together Application Guidelines (which are available in English, Spanish, French, Russian and simplified Chinese) to help you write a strong and competitive application. Be clear and concise. We follow a strict page limit as this helps us fairly evaluate applications. Applications must not exceed eight pages. Font size should be no smaller than 11pt. Please note that to be fair, we will not review materials after eight pages. Additional materials (reports, strategic plans, etc.) will not be reviewed. Follow the 3-3-2 formula. Due to the strict page limit, you need to be strategic with how you use space. We suggest that you allocate up to three pages to PART 1: Organizational Background, three pages to PART 2: Funding Request and two pages to PART 3: Financial Information. Do not forget to provide referees in PART 4. Remember your reviewer. 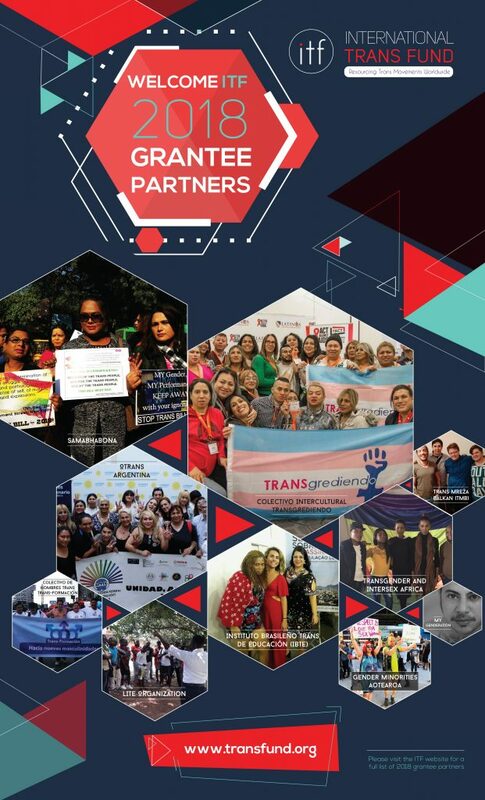 Your application will be reviewed by ITF’s Grant Making Panel (GMP), who are trans activists from different parts of the world. This means you should write to your peers, but know they may be peers who know very little about your working context. Trans activists know the importance of your work, just remember to describe its specifics. Make your application stand out. Be clear about what your group will do with the funding and make sure you tell us what impact it will have on your community and the trans movement. 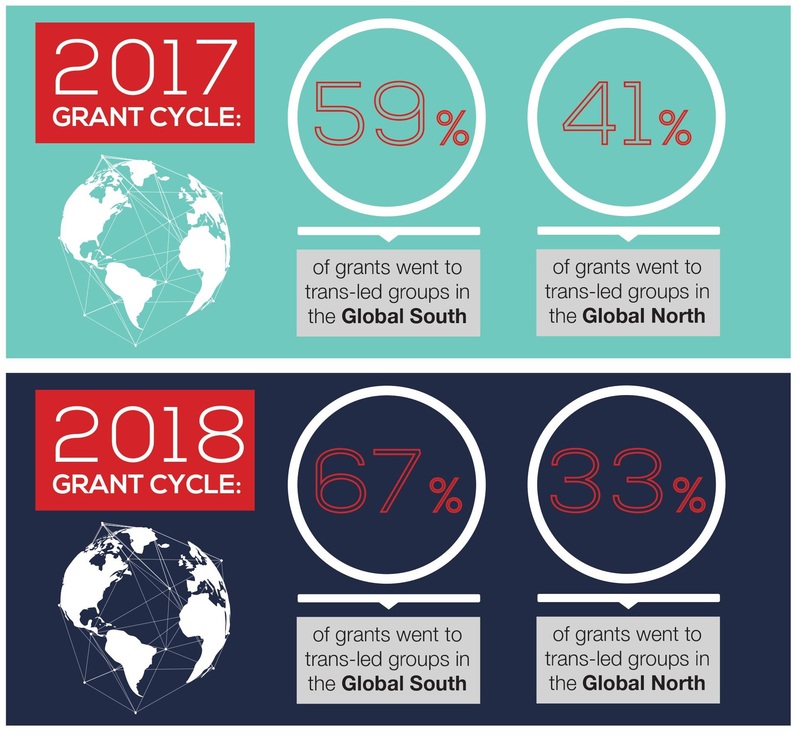 The competition for funding is very high and you need to make a case for why your work is important to trans movement building in your region. Be realistic. You are the experts of what needs to be done in your context so tell us what your group wants to do and not what you think we want to hear. The best applications are ambitious but realistic. This also includes the budget – ask for the funding that your group needs to do the work. If you are unable to write an application, we also accept video applications. The video should be a maximum of 10 minutes and answer all the questions in the application form. If you’re interested, you can find more information when you scroll to the bottom of this page. МТФ продолжает приём заявок в рамках 3-го грантового цикла. Мы ждём заявок от групп, которые возглавляют транс-люди, с годовым бюджетом, не превышающим 150 тыс. долларов, из любого региона мира. Крайний срок подачи: 1 декабря 2018 года, 17:00 по времени Нью-Йорка. МТФ имеет гибкую политику, и мы готовы финансировать различные формы самоорганизации. Мы принимаем заявки от коллективов, групп поддержки, зарегистрированных организаций, сетей, проектов и т. д. Однако для того, чтобы ваша заявка была рассмотрена, вашей группой должны руководить транс-люди (определение вы найдёте в Инструкции по заполнению заявок). Ваша группа необязательно должна иметь официальную регистрацию. МТФ отдаёт предпочтение грантам на общие/произвольные расходы. Мы доверяем инициативным группам, т. к. никто лучше вас самих не может знать, что вам нужно. Если вы всё же хотите подать на финансирование проекта, то также можете указать это в заявке. Мы предоставляем гранты лишь на один год. В большинстве случаев сумма гранта будет составлять от 10 до 30 тыс. долл. Гранты до 50 тысяч могут быть одобрены лишь в исключительных обстоятельствах. Мы не принимаем грантовые заявки на сумму более 50 тысяч или меньше 5 тысяч долларов. Мы принимаем заявки на английском, испанском, китайском (упрощённом), русском, и французском языках. Все группы должны заполнить форму заявки (которую вы найдёте здесь). С целью повышения доступности процесса подачи заявки для различных групп, мы принимаем видео-заявки. Эта опция предназначена лишь для организаций, которые не имеют возможности подать заявку в письменном виде, но могут сделать это в устном виде на одном из пяти языков (подробнее в Инструкции). Отбор заявок связан с высокой конкуренцией. За прошлые два грантовых цикла мы имели возможность предоставить финансирование лишь 11% групп, соответствующим базовым критериям. Если вы безуспешно подавали заявки в прошлые годы, призываем вас попытаться ещё раз в этом году. Пожалуйста, внимательно прочтите Инструкцию по заполнению заявок (здесь). Вы найдёте более подробную информацию на сайте transfund.org. Вы можете также связаться с нами по адресу info@transfund.org. 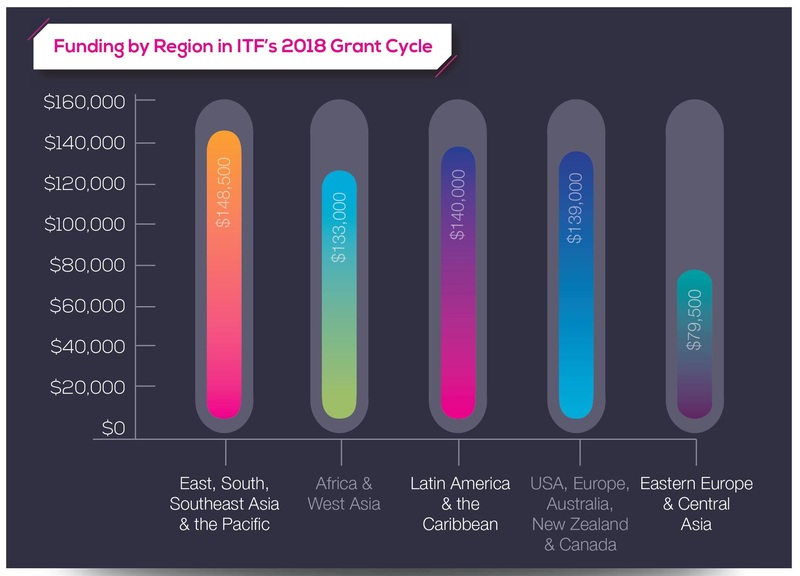 The ITF is accepting applications to our third grant cycle. 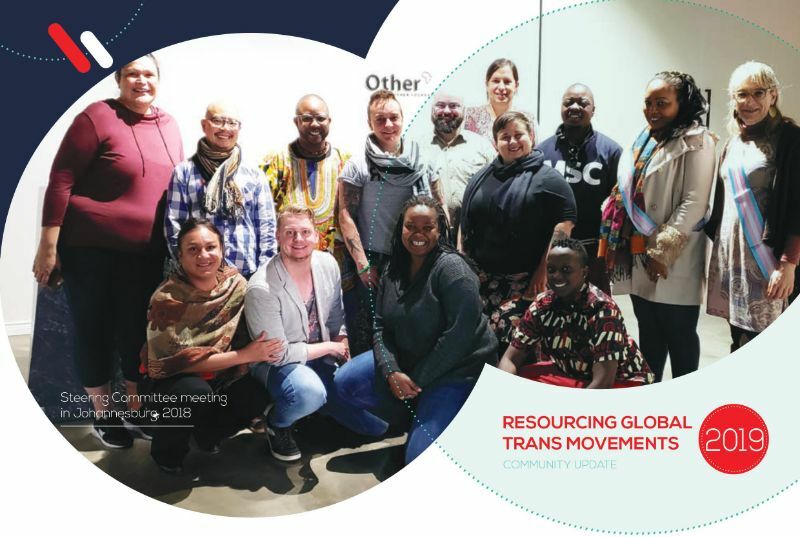 We warmly welcome applications from trans-led groups with budgets below $150,000 USD based in any region of the world. The deadline to apply is December 1, 2018 at 5pm (ET/New York time). The ITF is flexible and open to funding different forms of organizing. You can be organized as a collective, support group, formal organization, network, project, etc. However, in order to be eligible, your group must be trans-led (a definition is available here). Your group does not need to be registered. We prefer to make core/general support grants. We trust groups to know what they need. If your group would like to apply for project funding, you can specify this as part of your funding request. We are only able to make one-year grants. Most grants will range between $10,000 and $30,000. Grants up to $50,000 may be considered in special circumstances. We do not accept applications for funding of more than $50,000 or less than $5,000. We accept applications for funding in English, French, Russian, Simplified Chinese and Spanish. All groups must complete the ITF’s application form (available here). In order to promote accessibility for all groups, the ITF welcomes video applications. This is limited to organizations that do not have the capacity to write an application but are better able to provide a spoken application in one of our languages (learn more at the bottom of this page). This is a highly competitive process. If you applied in the past but were unsuccessful, you may apply again. We strongly encourage you to read the Application Guidelines (here). We are also hosting webinars in several regions, learn more on our website. 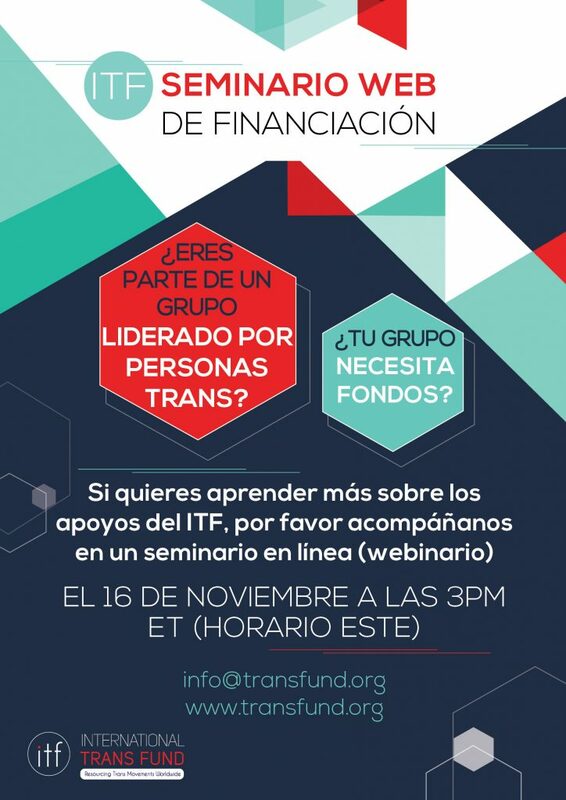 You can find more information at www.transfund.org or contact info@transfund.org. 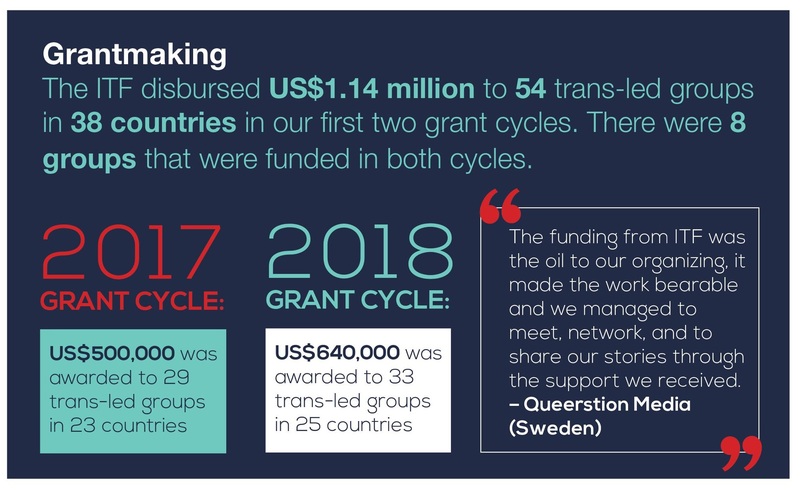 The ITF invites trans-led groups from Asia and the Pacific to join us for a webinar on how to apply to the third grantmaking cycle. During this webinar, we will share information about the eligibility criteria, funding priorities and the grantmaking process. We will also give helpful tips on how to write a strong and competitive application. After the presentation there will be an interactive discussion and an opportunity to ask questions. 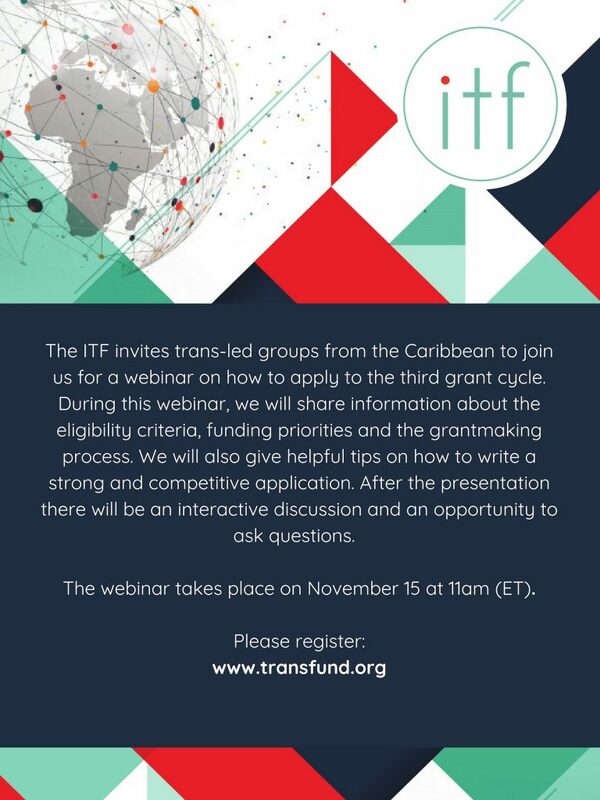 The ITF invites trans-led groups from the Caribbean to join us for a webinar on how to apply to the third grantmaking cycle. During this webinar, we will share information about the eligibility criteria, funding priorities and the grantmaking process. We will also give helpful tips on how to write a strong and competitive application. After the presentation there will be an interactive discussion and an opportunity to ask questions. The webinar takes place on November 15 at 11am (ET). The ITF invites trans-led groups from Africa to join us for a webinar on how to apply to the third grantmaking cycle. During this webinar, we will share information about the eligibility criteria, funding priorities and the grantmaking process. We will also give helpful tips on how to write a strong and competitive application. After the presentation there will be an interactive discussion and an opportunity to ask questions. The webinar takes place on November 14 at 3pm (EAT/Nairobi time).